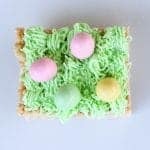 Do you need a dessert for Easter brunch or dinner or a cute treat for a child’s class party? 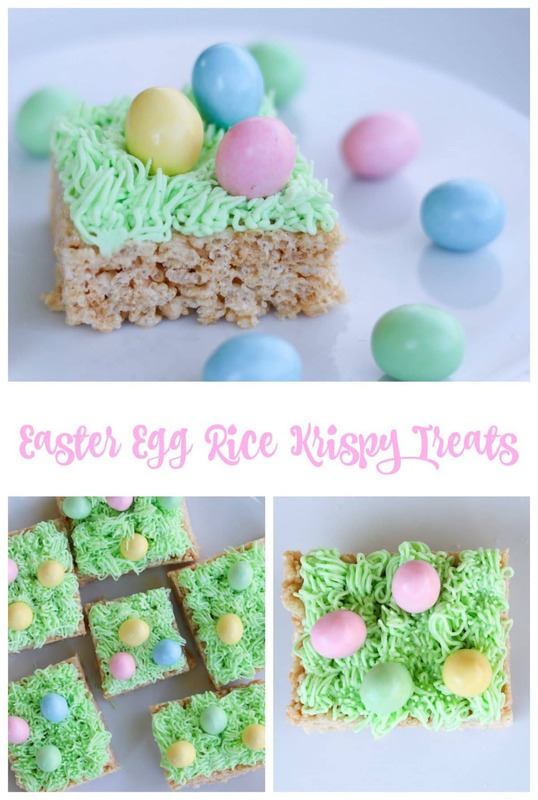 These adorable Easter egg rice krispy treats will be a huge hit with kids and adults. 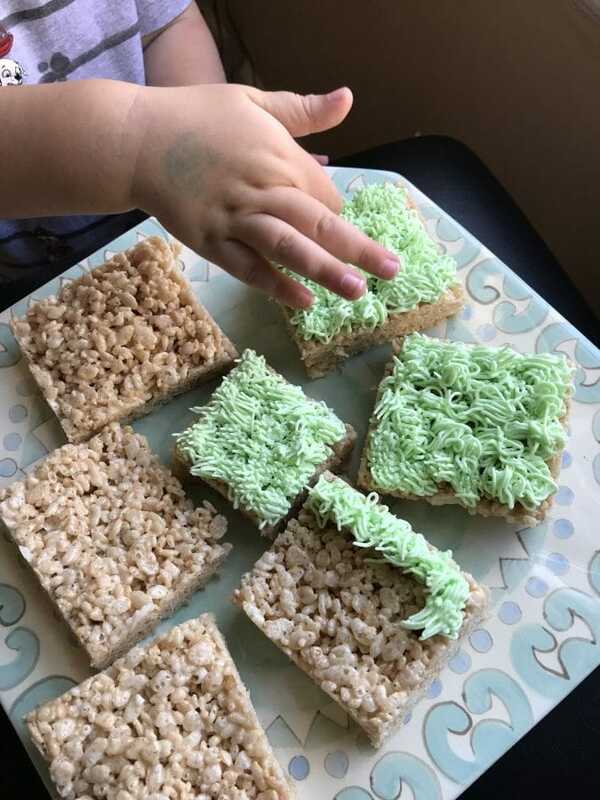 We love making rice krispy treats over here. The process is a little sticky, but it’s worth it. If you have rice krispies, butter, and marshmallows on hand, this dessert will come together quickly. 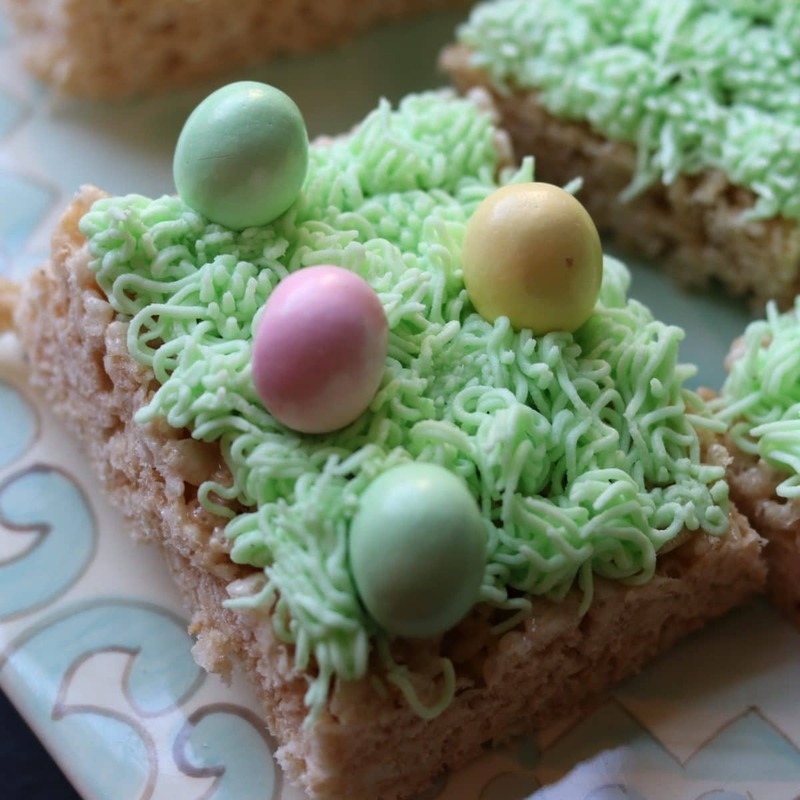 To make it fun for Easter, we just added some cute grass frosting and chocolate Easter eggs. So easy! This easy dessert came together in no time at all. 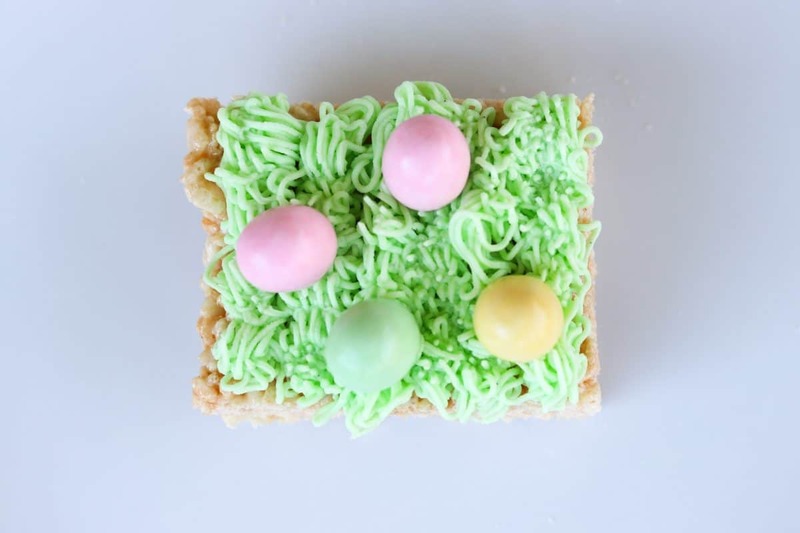 Rice Krispy treats are a super easy no-bake dessert option and topping it with cute green grass frosting instantly transformed a regular rice crispy square into an adorable edible Easter treat. For the Rice Krispy treats, we followed the simple directions on the box of rice krispies – Melt 3 tablespoons butter, add 10 oz mini marshmallows – stir until melted. Add 6 cups of rice krispies and stir to coat. 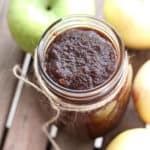 Press into a greased pan and let cool. 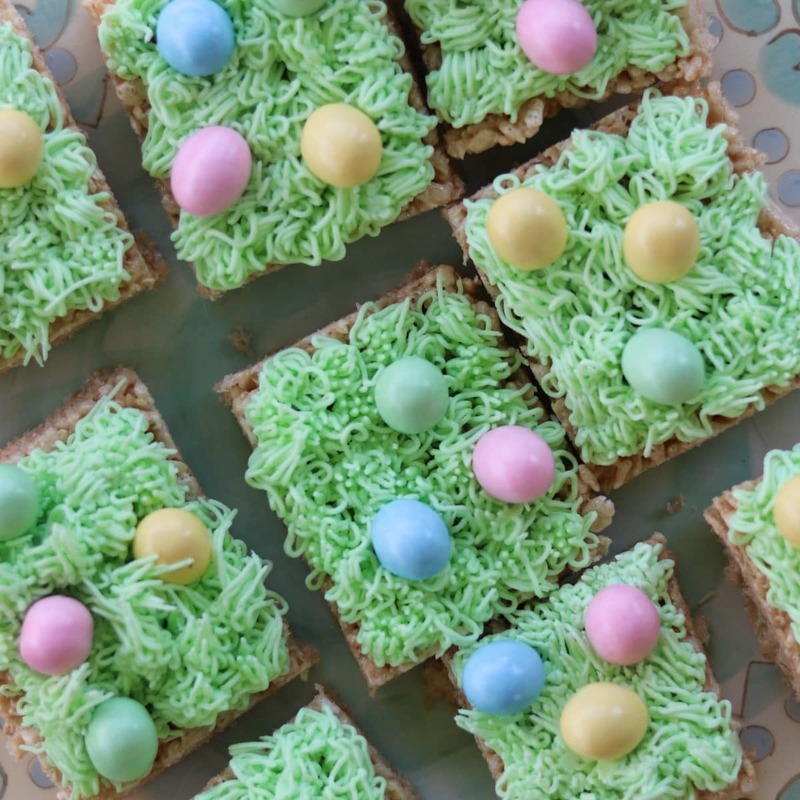 Cut into squares and prepare the frosting. For the frosting, I used my go-to basic buttercream recipe – 1/2 cup softened butter, 1/2 cup shortening, and 1 teaspoon vanilla extract. Combine. Add 4 cups of powdered sugar – one cup at a time – in a large mixing bowl. Add 1 to 2 tablespoons milk until your frosting is at your desired consistency and then add the food dye. You want the frosting to be stiff enough to stand up a bit and look like grass. To make grass, you will need Wilton decorating tip # 233. I love this tip. It is forgiving – trust me when I tell you that it is hard to mess up grass. I used this tip to make my football field mini cupcakes and even my kids helped with the grass making. Hershey’s Easter Eggs … so cute. My pro-tip for making grass … just go fast! Don’t overthink it. Grass is grass. 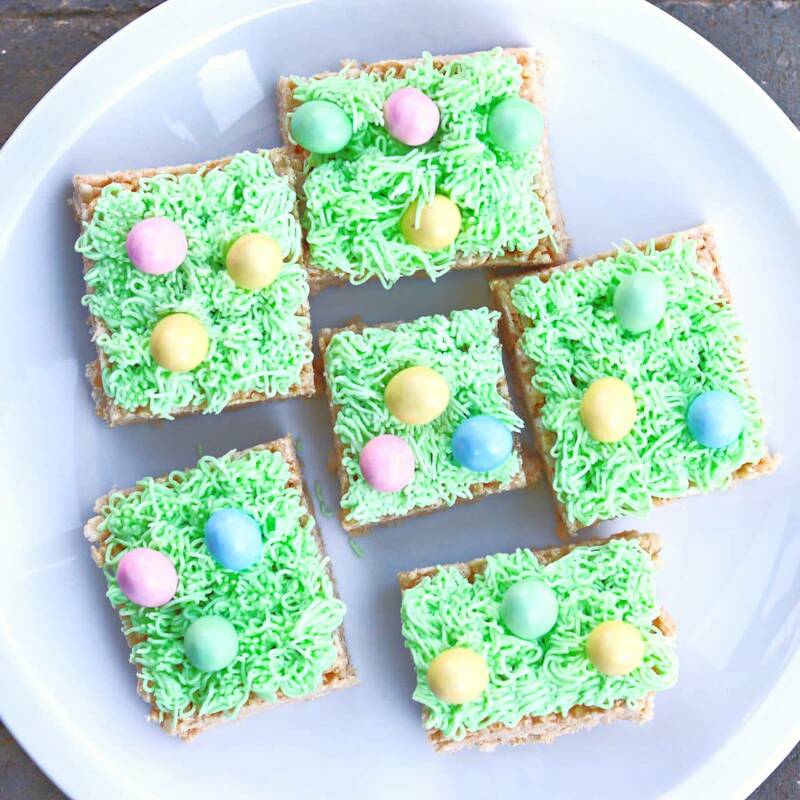 After you have made beautiful looking grass on top of your rice krispy squares, add a few colorful Hershey’s chocolate eggs. Could this project get any simpler? 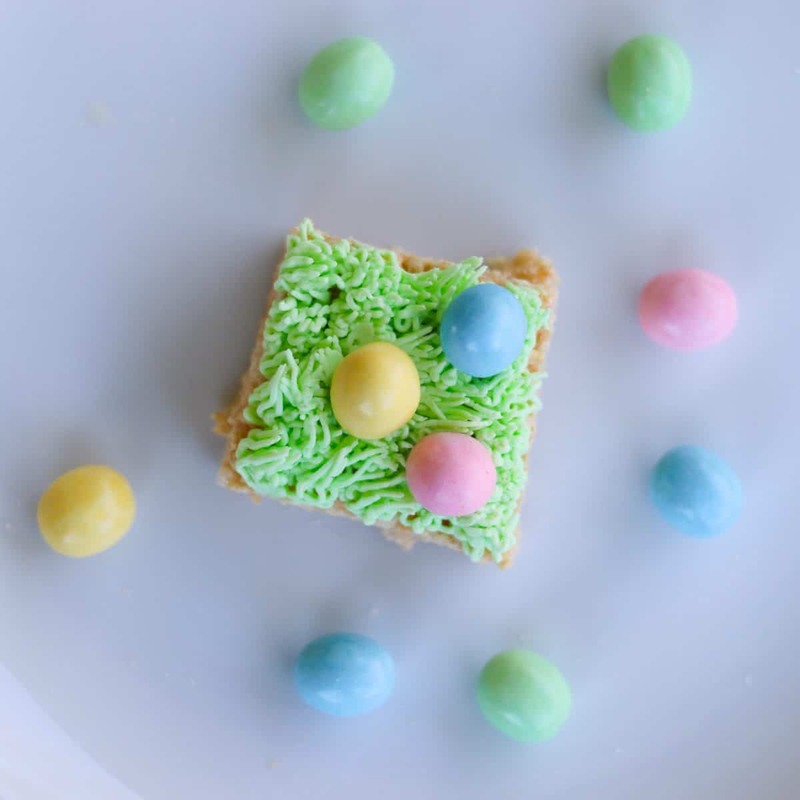 My kids loved helping to make the grass and placing the eggs around the squares – and, of course, eating the chocolate eggs while they worked. 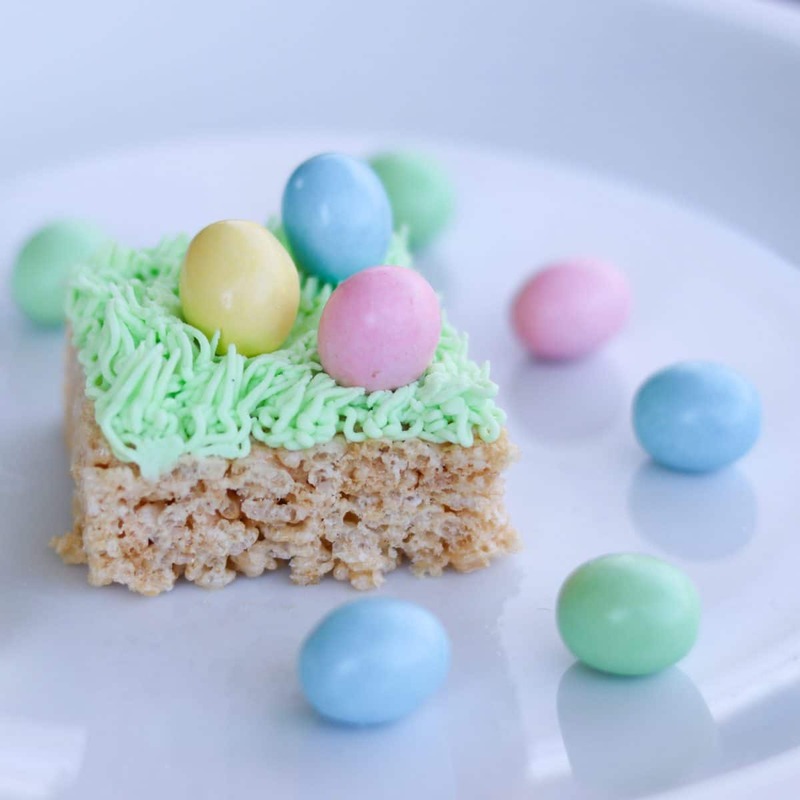 These super simple Easter egg rice krispy treats will be a hit with kids and adults. Melt butter in a pan. Add marshmallows. Stir until melted. Add rice krispies. Stir until fully coated. Press into greased pan. Let cool. Cut into squares. Keep well covered. 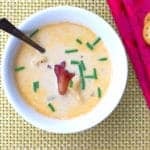 Combine butter, shortening, and vanilla in a large mixing bowl. Add powdered sugar, 1 cup at a time. Beat on medium speed. 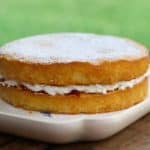 Add 1 to 2 tablespoons milk until frosting is medium thickness. 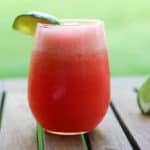 Add food dye. Scoop frosting into a decorator bag with TIP 233 on the end. Fill bag half full. Quickly, use an up and down motion to make grass.